Prev Lucky Little Leprechaun House Next Printable Purim Masks! Pink blossoms will soon appear on trees, and the National Cherry Blossom Festival starts on March 20 in Washington, D.C. In 1912 the city of Tokyo, Japan, gave Washington, D.C., a beautiful gift of 3,000 cherry blossom trees. In 2012, we celebrated the 100th anniversary of that gift. But really, every year is a celebration of that gift as those trees grace us with their annual beauty and provide countless amounts of natural joy and wonderment. which type of poster paint is it ? Ooh very pretty! I’ll have to do this with the kids! A must try with the grandkids, would make a great Mother’s Day gift from them. This is such a great idea! 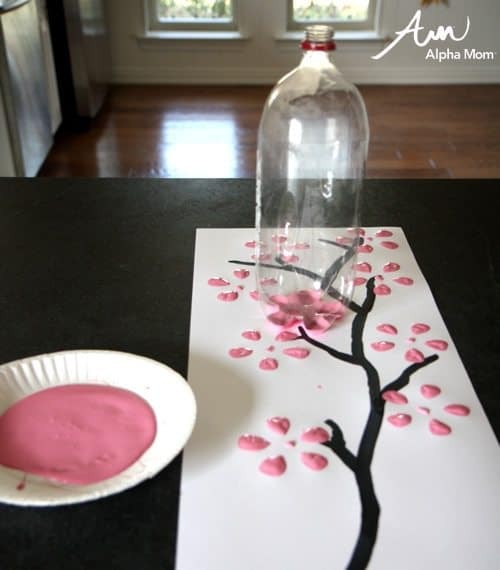 Im doing this for my baby girls nursery but using canvass instead. Thanks for the idea! 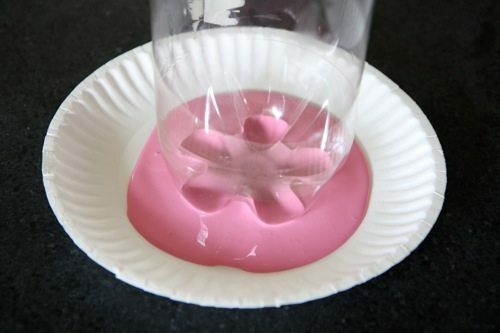 Super clever idea! Always looking for party backdrop ideas to share with my readers! 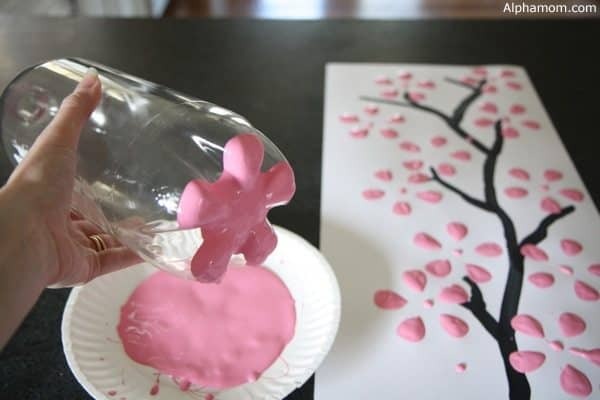 Do you think this would work on a stretched canvas because the pressure you have to put on the bottle to make the flowers? 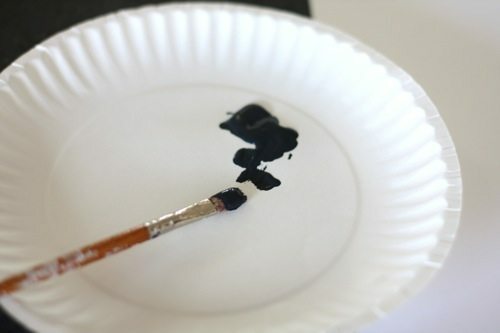 I think it would definitely work on canvas if you use enough paint because you don’t have to apply pressure at all. I tried this on a piece of stretched framed canvas and it didn’t work at all. Too much give and all five points didn’t come ot right and the paint smeared no matter how much or little paint I had on the bottle. Definitely need to be on poster board on a solid surface. Same happened to me. Didn’t work on a canvas. I’ll have to try again on a more solid surface. Can’t you just put something under the canvas to support it while you work? Books or something? This is so pretty! I want to paint my nails that color. Clearly, IT IS TIME FOR SPRING. Lovely – we’ve been looking for ways to celebrate the 100th anniversary. So pretty! Can’t wait to try this!! Thank you. What a wonderful idea! I love it! I am going to try this on a canvas and then want to hang it in my bedroom….Thanks for sharing! I want to do the same thing! But I just want to do it on a small piece of poster board and just put it up high where my cats can’t jump and tear it in half or something! Very Cool!! May I pin this?? sure, Marci. Would love for you to pin. Would prefer that you pin the first or second picture that includes a watermark (for copyright protection). Thanks! Rachel Meeks created this on behalf of Alphamom.com. I’m the owner of this site. Who are you? This is really cool! I could see this being something fun for my girls to do! This is such a great idea!! I am definetly doing this this weekend!! Saw this on Pinterest and had to check out the “how to”. Great idea! Suggestions on the best kind of paint to use? I think you could use any kind of paint. Craft paint works great on posters. I used some leftover wall paint from when we painted my daughter’s bedroom which made it nice and thick. OOhhh i am going to make this myself. This is a brilliant idea! Love this idea – found it on Pinterest. Hope you don’t mind, but I posted about it on my “Friday Favorites”. Fantastic idea! We’re definitely doing this! I’ve been considering painting a “Family Tree” on a wall with pictures of immediate family members, and eventually grandkids. I would love to do something with the flowers around it. 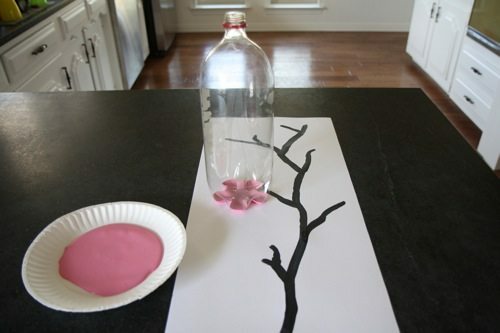 Would it work on a wall and would you suggest wall paint or craft paint if done this way? My concern about painting it directly on a wall is that it can drip, and later if you decide to paint over it you might still see the raised pattern from the flowers. This is so pretty! My daughter would love to try this! This report has become the center of attention even in Japan. It is a lovely Cherry Blossom. This idea is so cooooooool…….i was thinking for an idea to make a birthday card for my friend and i got to know about this….she really loved the ard an d thanks to this website…..!!! I’m doing this with my high school students for the 7 highly effective habits of successful people. But I’ve changed the cheery blossom trees to oak trees. Hi! 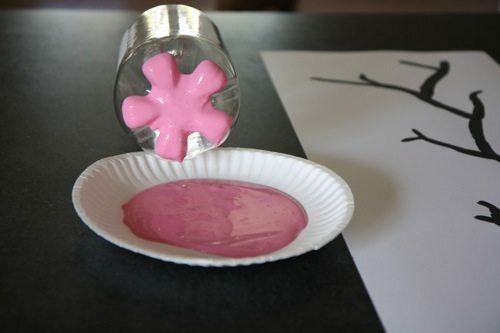 Do you think this will work on a wall or do you think the paint will drip down? 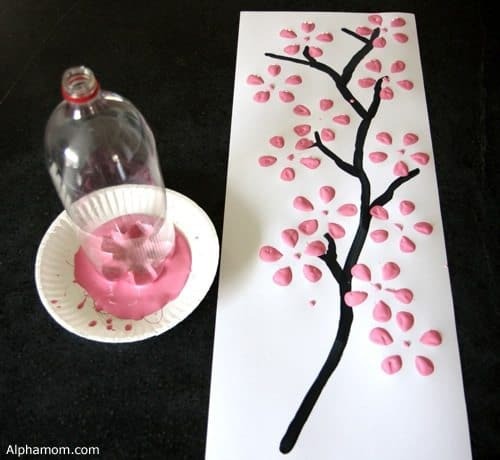 My husband and I painted a cherry blossom tree (pretty large) on one of our living room walls and we have been contemplating ways to paint the actual cherry blossoms on it. Rachel (the author) answered this same question above already. please read above for her answer. thanks. I saw this on Pinterest and repinned it..Love it .. This is wonderful, easy to make and frame. I used a Dr. Pepper bottle. If you look at mine, I think the petals are far apart on mine too. Thank you so much for your response! I did as you suggested and had a closer look at your pictures – while I can see what you mean, they are not super close together – using a Pepsi Max bottle was even further… 😉 Time to try the Dr.Pepper and some thinner, darker pink. 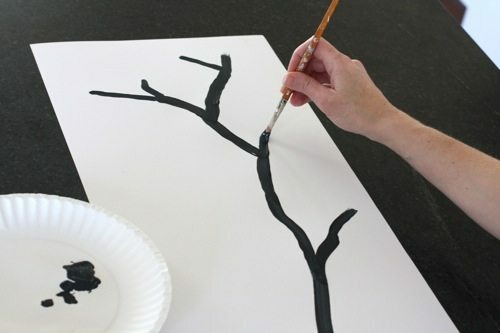 I want to write in Inkstick(sumi) the branches. Parabéns é lindo de mais adorei, sou louca por flores e essas de cerejeiras estão maravilhosas e facil de fazer, trabalho com crianças e sempre busco novidades para elas.